This post is sponsored by Kettle Brand! 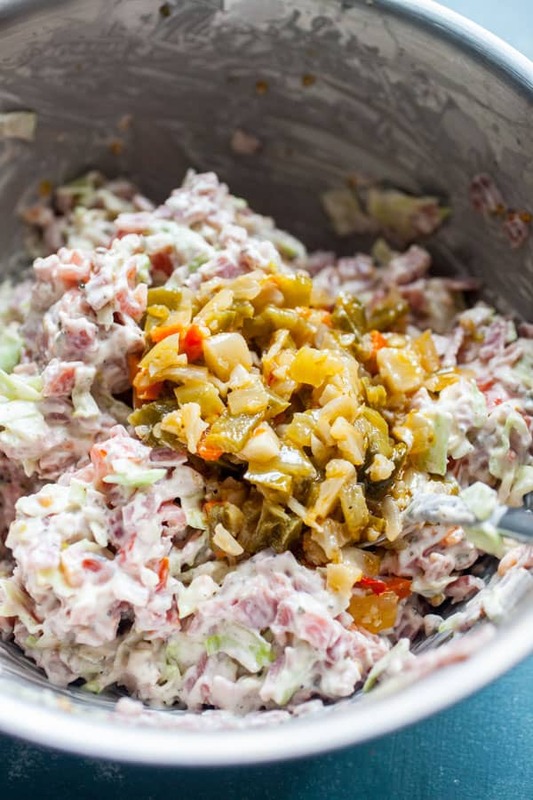 I used their Pepperoncini Flavor for this game-day ready Italian Hoagie Dip Recipe! Be sure to follow them on Facebook and Instagram for more great chip recipes. If I’m not mistaken, there’s a big football game just around the corner and, if you’re me, you aren’t terribly excited about watching a 41-year old Tom Brady in yet another game (okay – maybe it is kind of exciting). But, mostly I’m excited about the snack spread and you better believe this Italian Hoagie Dip will be on my table! This dip is absolutely perfect for a sports party. Who doesn’t love a good Italian hoagie, but you don’t necessarily want to commit to eating a whole hoagie when there’s tons of other snacks available! 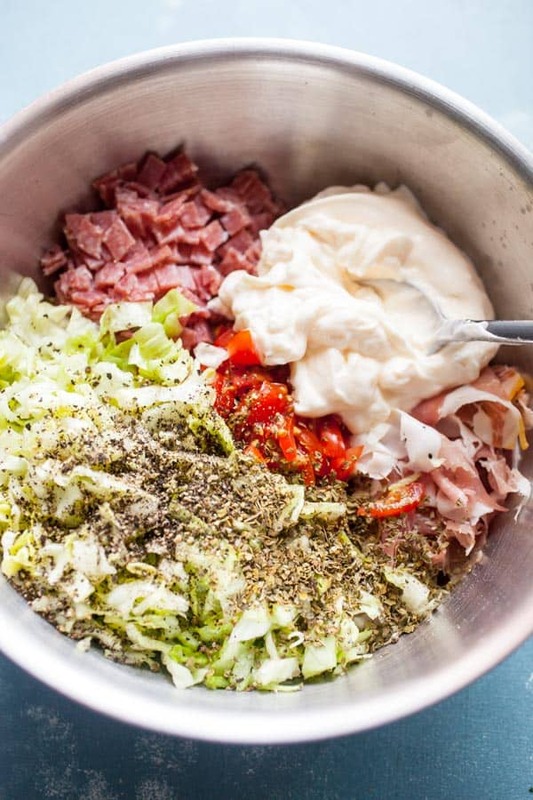 So this hoagie dip has all the same flavors but you can portion it to your liking (or just binge eat it – I won’t judge). The absolute end-game pairing for this dip is Kettle Brand Pepperoncini Flavor. Like, whoa. If you can’t find that variety, I would just go with their sea salt variety. You definitely need a crunchy, sturdy chip to stand up to the hearty dip and Kettle Brand delivers exactly that. 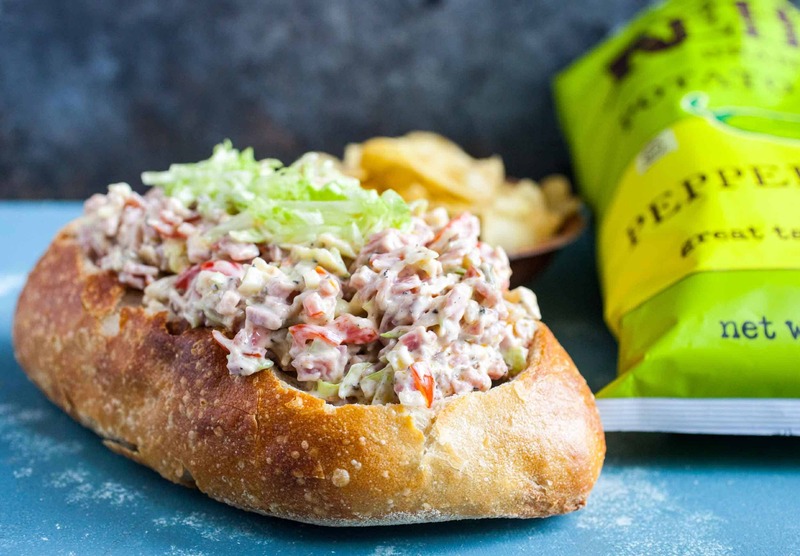 The ultimate game day dip for your next party is this Italian Hoagie Dip recipe! Classic Italian flavors stirred together and served with crunchy chips! YUM! 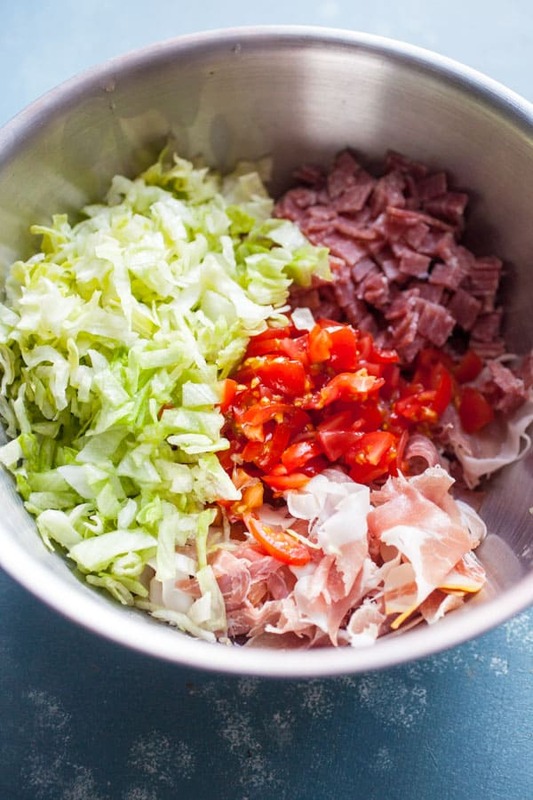 1) Dice meats into small pieces and stir together with diced tomatoes and iceberg lettuce. Stir in giardiniera, mayo, and spices. Taste and adjust to your liking! 2) Serve dip in a medium bowl topped with a little extra iceberg lettuce. Optionally, you can hollow out a bread boule and serve the dip in the bread bowl. 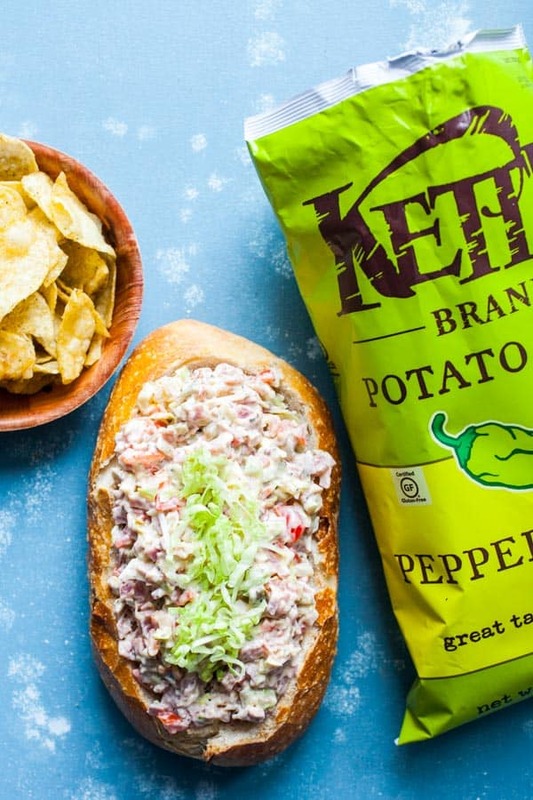 3) Store the dip in the fridge until you need it and serve it with a big bowl of Kettle Brand Pepperoncini flavor! This dip starts with delicious Italian meats! 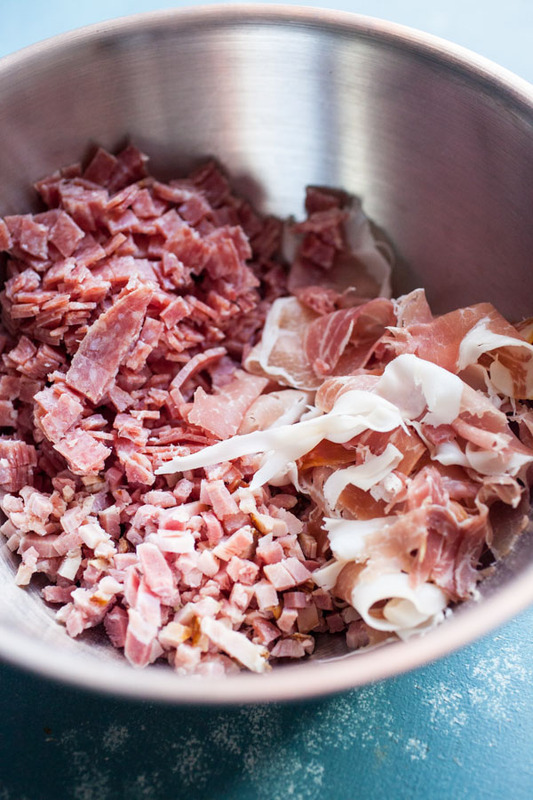 I see some versions of this dip with roasted turkey mixed in as well, but I like to keep it in the cured meat family. For me this means adding ham, prosciutto, and salami. The prosciutto is hard to chop up so I just kind of pull it into pieces so it is separated. Then add some fresh veggies. Tomatoes and iceberg lettuce! Trust me on the lettuce. It’s excellent in this dip! This time of the year, I just use cherry tomatoes which are readily available and ripe. Then add the mayonnaise and spices! Getting close to having a finished Italian Hoagie Dip already! Stir that all together and add the final secret ingredient: A big scoop of Italian Giardiniera. Depending on the brand, you might want to dice it up before stirring it in. Mine was pretty diced already. Stir everything together, taste it, and the it’s ready to serve! You can either serve the Italian Hoagie dip in a large bread bowl or just in a normal serving bowl. It’s a hearty dip and this recipe will feed a crew paired with crunchy potato chips! Here are a few other great game day appetizers! Very clever idea! Love it.